In this blog, Rob Allen argues that supporting low or no income entrepreneurs through a Universal Basic Income can help communities become empowered. By Rob Allen, director, business5zero. 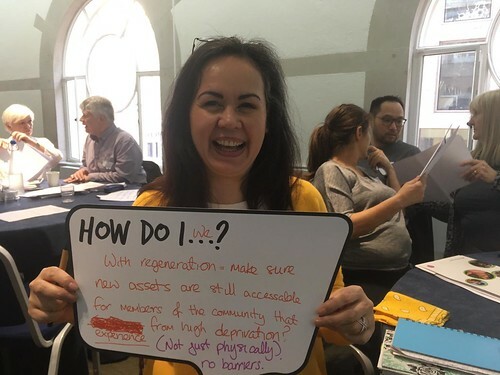 Thanks to support from the Paul Hamlyn Foundation Ideas and Pioneers Fund I have been attempting to understand why self-employment in disadvantaged communities in the UK is half that of the national rate. I have found that enterprise is a powerful way to empower communities, but UK enterprise support systems only work for some. If you have no money, are in debt and live in a poor neighbourhood, you are effectively barred from self-employment, regardless of whether you have the motivation and a viable business idea. I believe that communities can become empowered through enterprise support that suits them. Enterprise resources can work in more inclusive and effective ways, providing community-led support for low or no income entrepreneurs, creating job opportunities and boosting local economies. This opens up exciting opportunities for the way we think about enterprise support for economically marginal and less prosperous groups in the UK. Low or no income entrepreneurs are disproportionately impacted by public policy, worklessness, the poverty trap, capital flows, lack of affordable finance, credit checks and onerous eligibility criteria. I have scoped out some of these issues with the help of people impacted by them and have captured this learning to co-design some potential solutions based on experiences and insights. We should start with the entrepreneur rather than the enterprise, and help them build a business from their own strengths rather than assuming their initial idea is what should be invested in. I have also learned that it might be possible to achieve outcomes that have eluded top-down public-sector funding and more traditional project-based grant programmes, if we can develop trust, confidence, skills and partnerships at a local level. These things are arguably more effective and certainly just as important as the sorts of hard project-based outcomes that can dominate traditional funding. The biggest challenges to innovation in this context are selling ideas and finding investment. Most of the money is held in broken systems that feed their own demise. We require brave, entrepreneurial minded people with the will to release money and other resources from these broken systems. Finding and building productive relationships with these people is critical. Is a Universal Basic Income the answer? Numerous business support initiatives, from advice and mentoring, through to coaching and voucher schemes - in which the UK Government invests millions - are aimed at the right problem, but don’t provide a workable solution for those from less privileged backgrounds. My research to date suggests that investment could instead be used to develop new models of support that are good for communities and have the potential to ensure that resources are distributed equitably. It is time for a grown-up conversation about a Universal Basic Income (UBI), which would give all citizens a sum of money, regardless of their employment status. This could play a role in enterprise support for economically marginal and less prosperous groups in the UK. It is already proving to be successful in Finland, where a trial of UBI has found that it lowers levels of stress and provides more incentive to work. By putting more money in the hands of more people, it is possible that UBI could create more potential customers and lead to an environment with more incentive and opportunity to create new businesses to serve new customers, all while empowering communities.